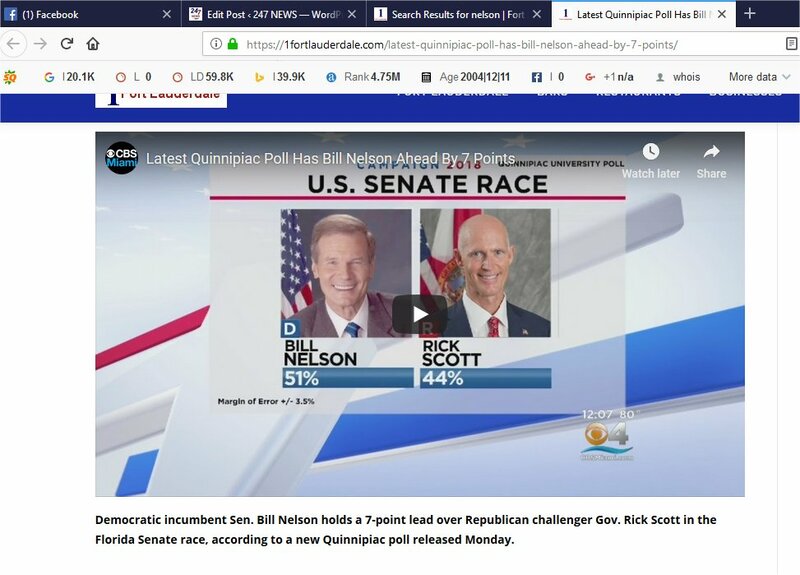 All the Major Media that is run by Liberals tried their best to get Gillium and Nelson elected in Florida by putting out FAKE NEWS just before the election incorrectly showing Polls showed these Democratic parties way ahead. However all the FAKE MEDIA got it wrong, even though every mainstream liberal media had Nelson and Gillium leading by as much as 7 points, both lost. Why would the media use polls that blew both races? These polls are how FAKE NEWS is created to steer the public to the liberal agenda of big media. By saying a politician is ahead in polls by as much as 7 points which the liberal FAKE NEWS CARTELS of NBC, CBS and ABC did, the expected results is Republicans voting for Scott and DeSantis would stay home, no one wants to vote for a loser. 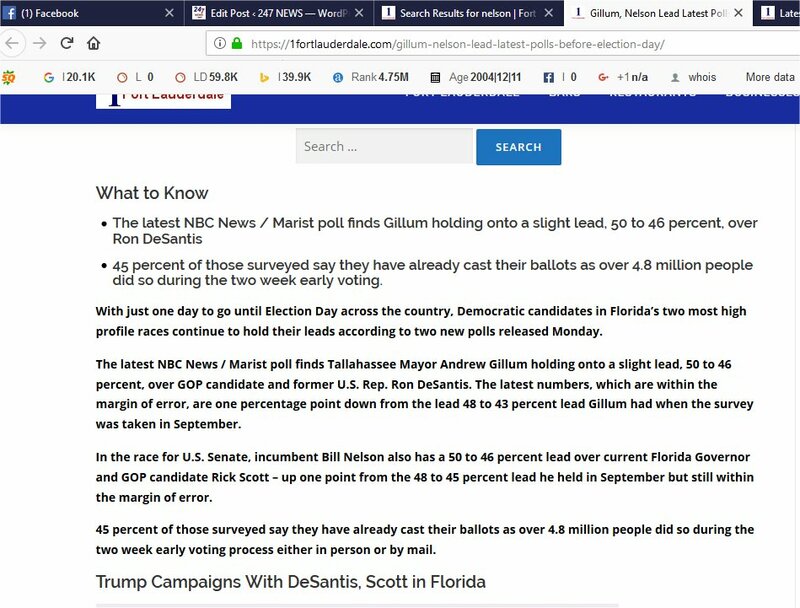 Before Election local media in South Florida showed huge early voting lines filled with black and Hispanic votets with Gillum and Nelson signs. Why would the liberal FAKE NEWS CARTELS show over and democratic areas with democractic minority voters and not show affluent areas where white, black and Hispanic voters were waiting in early voting lines with Scott and DeSantis signs? That would make Republicans want to get out and vote. So while you had the sitting President of the USA personally showing up in Florida at rallies for Scott and DeSantis, the liberal FAKE NEWS CARTELS showed minority celebrities like rappers at rallies for Gillum and Nelson. Yes both races in Florida were close races, but before that truth manifested the liberal FAKE NEWS CARTELS tried their best to show Gillum and Nelson were supposed to win. When I founded 1 Media I wanted to create a network of local, national and global news sites where I could zero in locally to local news outlets to give users accurate local news. 247 News has existed for over 2 decades and it’s front door has over a dozen up to the minute major news bureaus feeds being pulled to give you the latest breaking news of all the Major Media around the world. Unfortunately, 1 Media must distribute the FAKE NEWS on its 300+ local search and business portals since companies such as CBS, NBC AND ABC are a major part of major Media. They are the heart of the liberal FAKE NEWS CARTEL and all of them should be sued in a class action for distributing FAKE NEWS to try to sway an election. A real poll has a 3 to 4% margin of error. To say someone is up 7 points by a poll just before Election day is a gross violation of the ethics all media has to be truthful. Free Press does not apply to LYING PRESS trying to use Free Press to sway an election. 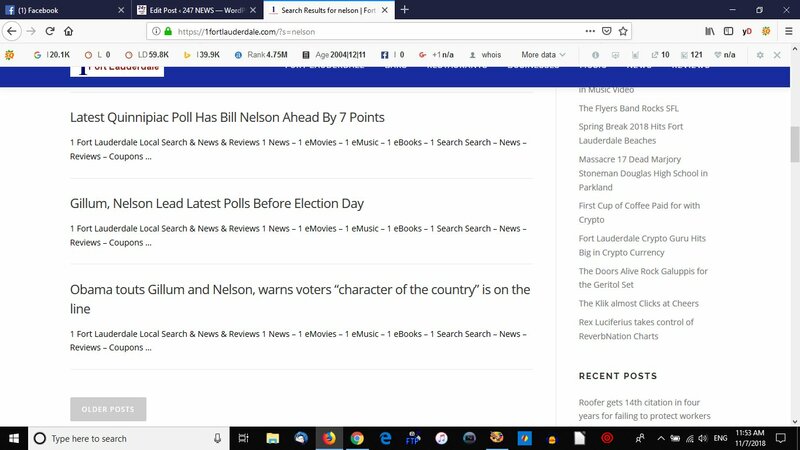 Here are screen shots from a 1 Media local news portal showing up how the FAKE MEDIA tried to distribute FAKE NEWS to make democratic liberal candidates win. The news was distributed by a 1 Media portal that on a local level has very few news outlets to distribute from that are not part of the liberal FAKE NEWS CARTEL. 1 Media is trying to be ethical in what has become the sewer of local and national news dominated by the liberal FAKE NEWS CARTEL. Here are some screen shots of news from the FAKE NEWS CARTEL distributed on some 1 Media sites. They got the main results in the Florida Election 100% WRONG. They used FAKE POLLS to distribute FAKE NEWS.